'Choose & Chop' a large tree in our paddock, or get one of our ready cut fresh trees from our sales barn. 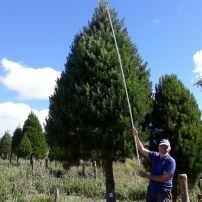 We have been growing and selling Christmas Trees for over 20 years. 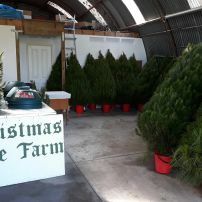 Once again, this year we will have a good range of freshly cut trees in our barn. We also sell tree stands. The trees that we have left growing in our fields for 'choose and chop' are mostly quite large. We have some trees up to 4m. commented on "We have a new delivery of very nice trees and expect to have trees available through the last weekend." We have a new delivery of very nice trees and expect to have trees available through the last weekend.